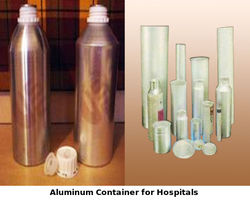 Prominent & Leading Manufacturer from Bengaluru, we offer aluminum container for hospitals. Aluminum Container for Hospitals offered come in high strength finish with seamless/no joints that provides for complete safety of products packed inside. Also being non-corrosive in nature, these containers are leak proof as well as come with long shelf life. Coming with hygienic (with food grade lacquering) support, these containers are also pilfer proof, puncture resistant, recyclable and bear excellent barrier properties. We make these available in attractive metallic finish in sleek designs in finish options of silver, gold, white. The containers can be made available in many size options as well as with internal coating support to prevent attack by corrosive products. Looking for Aluminum Container for Hospitals ?